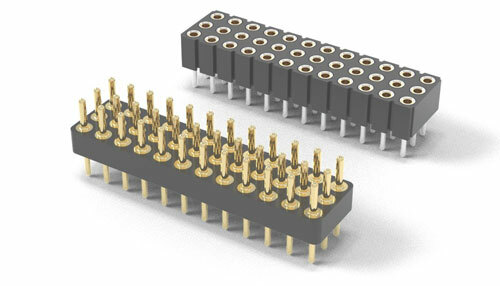 The 804 & 805 series connectors are RoHS compliant featuring high temperature thermoplastic insulators compatible with lead free soldering temperature requirements. The receptacle shells of the 805 series socket pins are plated with 200µ" pure matte tin. Hard gold plating, on both the 804 series header pins (10µ") and the 805 series receptacle internal contacts (30µ,") provides optimum conductivity and effective wear resistance. All Mill-Max pin headers and receptacle sockets feature high-speed screw-machined pins and receptacles manufactured to precision tolerances. Inside each 805 series receptacle is a precision stamped beryllium copper Mill-Max #47 contact clip with a pin acceptance range of .025 - .037" (0,64 mm - 0,94 mm) diameter or a .025" (0,64 mm) square post and a current rating of 4.5 amps. Selectively loaded pin configurations can be quoted to customer specification.